Rochester, NY (November 17, 2016) — Omni–ID, the leading global supplier of high-performance, industrial RFID tags and ProVIEW visual tagging systems today announced that it has been recognized by leading analyst firm Frost & Sullivan for its product strategy leadership in developing and implementing RFID solutions for the manufacturing industry. The company was also recognized by Frost & Sullivan in 2013 and 2015 for its leadership position in providing RFID solutions to the manufacturing industry. Omni-ID, along with other leading technology companies from around the globe will be recognized during a formal ceremony held in La Jolla, California in January 2017. 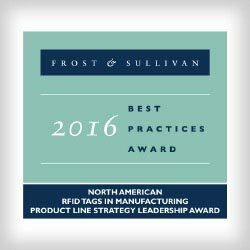 The report published by Frost & Sullivan highlights Omni-ID’s focus on innovative RFID tags and solutions for the manufacturing industry – with a focus on continued innovation and development of products to address the unique needs for this key industry. The report also features Omni-ID’s Manufacturing and Logistics product portfolio, including its ProVIEW visual tagging system. The complete research report can be found at: www.omni-id.com/frost2016 . Based in Rochester, NY, Omni-ID has developed original, patented technologies for on-metal and visual tagging to enable a broad range of applications to improve asset tracking, supply chain management and work-in-process. Omni-ID is the leading supplier of RFID tags and visual tagging systems for Manufacturing & Logistics, Energy, IT Assets and Tool Tracking. Omni-ID’s versatile family of products provides a complete range of tags and auto-ID solutions for tracking and identification challenges, with unprecedented accuracy, in any environment. For more information, visit www.omni-id.com.